The Great Siddha Naropa is a deeply revered Buddhist Teacher. He lived in India in the eleventh Century. Naropa was among the enlightened teachers of the Kagyu lineage of Tibetan Buddhism. 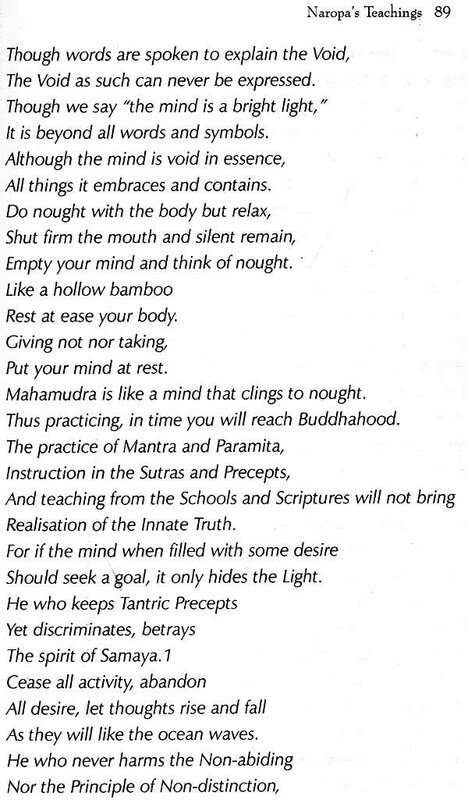 Before becoming a spiritual teacher, Naropa was an undefeatable scholar at the Nalanda University, the place where he first felt the vibration of the name, Tilopa. Naropa was born in a respectable Brahmin family that had considerable power and riches at their disposal. Tilopa laid the foundation of Naropa’s spiritual life and became his root Guru. The Story of Naropa expresses complete surrender and an unfailing belief in one’s guru or master so that a student can become in sync with his master’s mind. There are multiple suggestions regarding the place of aropa's birth. Some of the biographers state that he was born in Bangladesh. 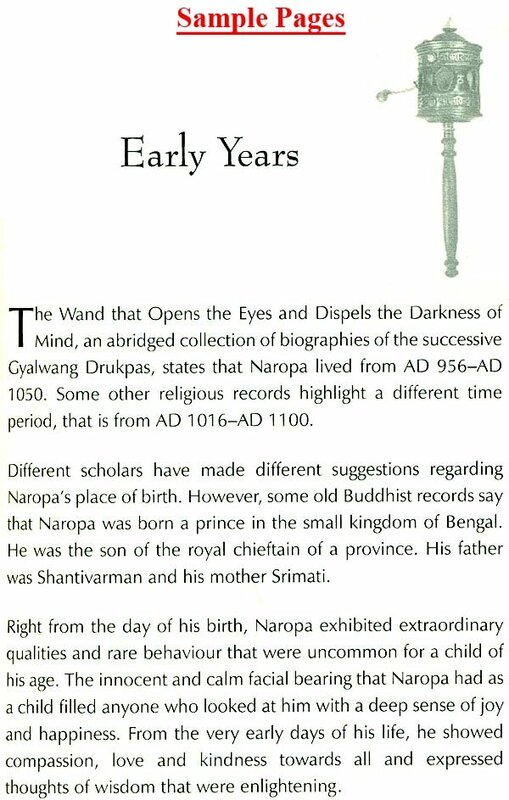 However, Marpa, one of Naropa's prime students and his successor has affirmed in his documents that Naropa was born in Lahore, then a part of India. Naropa was born in a respectable Brahmin family that had considerable power and riches at their disposal. In those days, the servants and attendants of such illustrious families addressed their masters as Kings. It is now believed that since such a trend existed at that time, some of the biographers may have erroneously claimed that Naropa was a prince. Naropa had begun to show a strong inclination towards spiritual development since the young age of eight. Although he was born to a well-off family where all the comforts and luxuries of life were available to him, Naropa chose to explore the ethereal realm of spirituality. 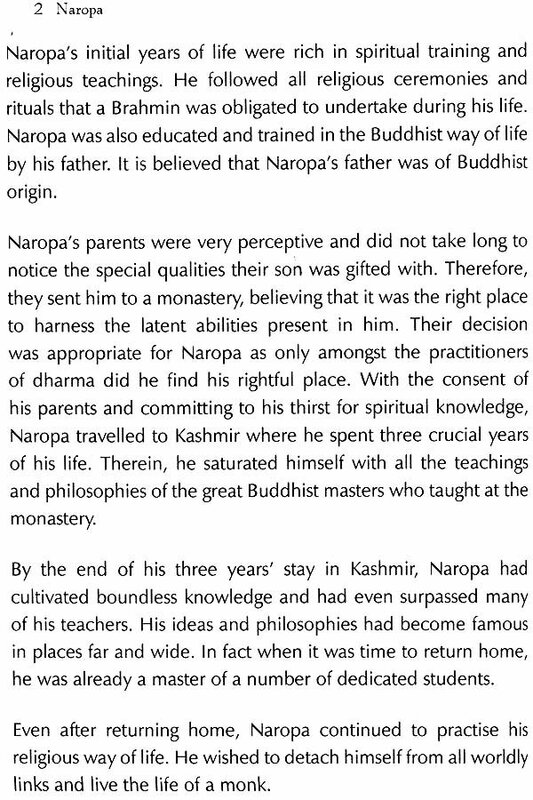 In Naropa's time, Kashmir was a seat of higher Buddhist learning. Submitting to his religious yearnings at the young age of eight, Naropa travelled to Kashmir to study spirituality and religion under the guidance of Master Arya Akasha, who was also known as Master Gagankirti. Following the advice and teachings of his Guru, Naropa received lay ordination. Although not at all keen to enjoy the benefits of marital engagements, Naropa had to agree to marriage under the continuous pressure of his parents. Thus, he married a lovely Brahmin girl, Sangmo. 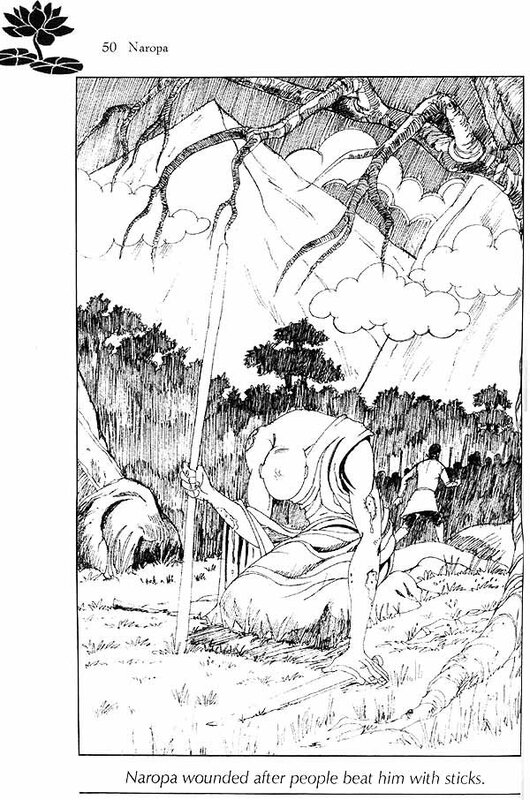 Sangmo was a pleasant-natured girl and held an immense interest in spirituality just like Naropa. As a result, they both lived a happy married life. At the age of twenty- five, after eight years of married life, Naropa wished to dedicate his life completely to spiritual pursuits. Therefore, following mutual agreement, Sangmo and Naropa dissolved their marriage. Thereafter, aropa accepted a monastic way of life. Over time Sangmo's interest in spirituality also grew stronger and deeper. In later years, Sangmo became one of the most dedicated and advanced disciples of Naropa and a devoted spiritual companion. She also served Naropa when he lived in Pullahari in Kashmir. For many exhausting days that would end in fatigue, Naropa travelled eastwards to meet his destined Guru, Tilopa. Tilopa laid the foundation of Naropa's spiritual life and became his root Guru. 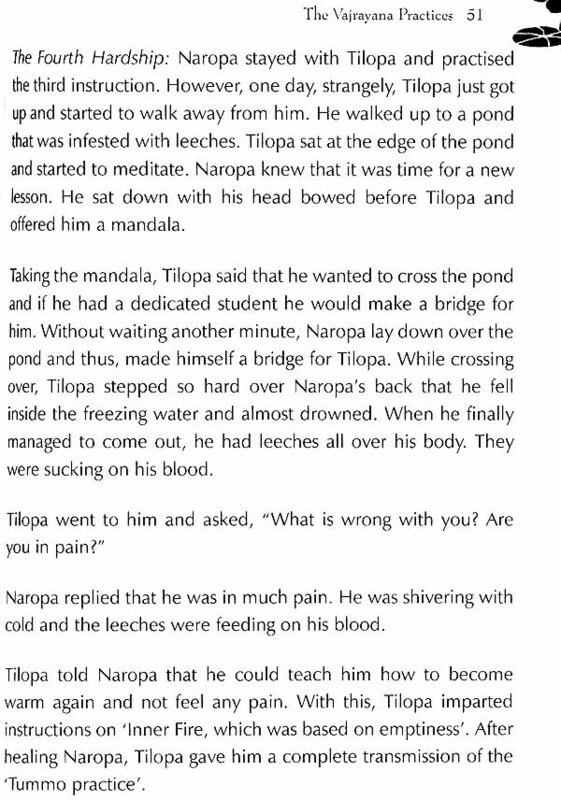 However, when Naropa met Tilopa, he made Naropa undergo difficult tests. To tread on the path of spirituality, Naropa had to purify his karma and clear his conscience of all the emotions and needs that worldly duties and attractions bind humans to. 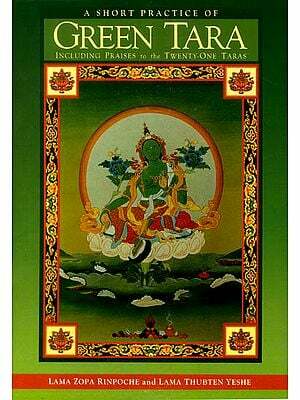 To reach this state of clear conscience, Naropa was made to experience 12 major and 12 simpler hardships of life. When he completed all the tests of hardships, Naropa experienced an awakened state of mental clarity and harmony, the state of Vajradhara. Naropa had received a direct transmission to this state from his guru, Tilopa. Upon reaching this state of mental bliss, Naropa embarked on a journey to disseminate the learning he had acquired. He travelled from one place to another and gradually amassed a number of disciples who followed his teachings. Among all the devoted disciples of Naropa, Marpa is the most famous. Marpa not only succeeded Naropa in the spiritual lineage but also took his teachings and transmissions to Tibet. While Naropa taught in many places, he established a number of Buddhist monasteries in Kashmir. Of the eighty-four great Mahasiddhas in the spiritually rich history of Buddhism, Tilopa and Naropa are recognised as two. 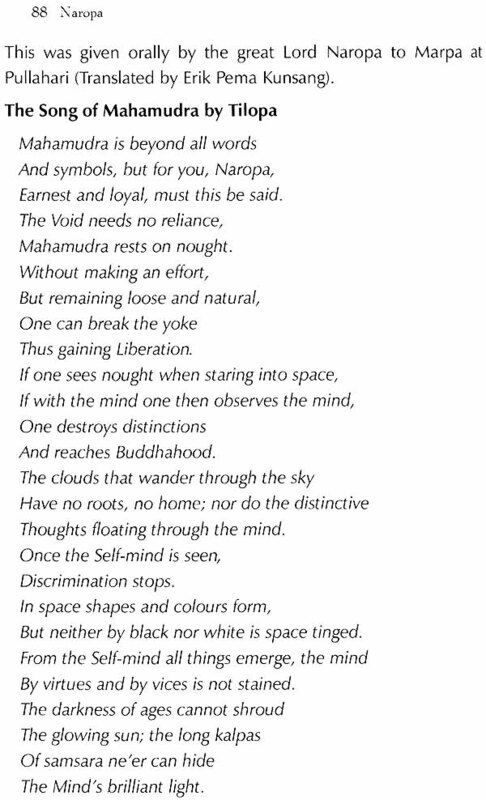 The most famous teaching that aropa received from Tilopa - The Six Doctrines, later were popularly known as The Six Doctrines of Naropa. These teachings have been passed down for a millennium through the lineage of Tibetan Buddhism. Chogyam Trungpa, a famous Buddhist meditation master, has explained through his famous 200 Percent Potent Teachings that the path to spiritual awareness is tough and full of challenge He explains that in order to experience true reality, one has: to step beyond the comforts of conventional expectations and conceptual attitudes and take on the difficult path of unlearning the worldly habits. The story of Naropa reflects the tantric model of the same process. To give a better understanding to today practitioners of meditation, Trungpa in his commentaries had made a strong reference to the exceptional story of Naropa spiritual journey. Through his suggestions, Trungpa aimed to facilitate detachment from worldly ties for all his students , different levels of spiritual practice. By setting Naropa's life as an example, Trungpa threw open the doors of devotion and religion to the students of Buddhism belonging to the West. The story expresses complete surrender and an unfailing belief in one guru or master so that a student can become in sync with his master's mind.